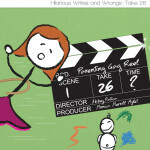 Let me start by saying, I’ve waited on this book from the moment I stumbled across Momastery.com, exactly one year, and 86 days ago. Which, ironically, is before the author found out she would be writing the book in the first place. Or at least before she told us Monkees. So, to say I was excited when TLC Book Tours asked me to review it, ON ITS BIRTHDAY, is a gross understatement. Oh, and when I figured out that request involved getting an Advance Reader’s Edition copy, directly from the publisher, Scribner Books…well, I peed a little. Okay, a lot. Then I told all my friends…or anyone who would listen. 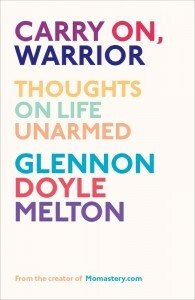 So this is a big deal for me folks, because I am about to give y’all my 2 cents on Carry On, Warrior—Thoughts on Life Unarmed, the first book written by my girl crush blogging idol, Glennon Doyle Melton. A woman who has, unknowingly, changed my life. I’ve read the book twice already. Back to back, in fact. It’s that good. Lucky for me, the copy I pre-ordered before I was asked to review it will be here today, because the second time through, I read with a yellow highlighter in my hand, marking all my favorite passages along the way. Now it looks like SpongeBob Squarepants puked in it. Of course, that’s the copy I will be taking with me to be autographed when I meet Glennon in a couple of weeks on her in real life book tour for this magnificent baby. I can hardly wait! Now, those of you who already follow Momastery, and no doubt, love Glennon as much as I, are aware of what a gifted storyteller she is, and what this book is all about… Love Wins. We Can Do Hard Things. Life is Brutiful. For those who aren’t familiar, (Hello? Where have you been?) 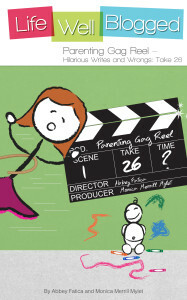 it’s a collection of essays on facing life’s challenges– relationships, parenting, faith, addictions, fears–told with such authenticity, humor, forgiveness and bravery, you’ll no doubt find yourself nodding in agreement and/or recognition more than a few times. For me, page after glorious page delivered a shiny new gem, I not only identified with, but heard myself telling in my own voice. It’s almost as if she crawled inside my head and dipped her pen into the inkwell of my brain. I’ve read hundreds of books in my 41 years, and I can honestly say this is the very first time that every single word my eyes fell upon resonated so deeply I cried…at the sheer realization that someone ‘really gets me’. Funny that it’s a virtual stranger, huh? But really, she’s not. If you look closely enough, parts of her are inside all of us, and to quote another Monkee mantra: We Belong To Each Other. Read the book. You will not be sorry. 1. You must go over to my Facebook page and ‘Like’ it. The contest will close on Friday, April 5th at 12am, PST. From the official entries on The Calibamamom FB Page, a winner will be chosen at random, announced here and there, and notified via email, within a few days of the closing of the contest.